Not enough friends? Get a bot! was my second post on this blog. I was learning some Machine Learning back then. I found that many devs were using Marcovify and I thought it would be fun to create a bot to interact with my friends. But I found that it was not so simple to create a bot for WhatsApp. You need to set up a business account and pay for it. So I built it on Telegram. So well, our bot was there. Hosted on my local docker, so we could go to Telegram once in a while to have fun with it. A few days ago I found a video where Jarrod Overson was automating VS Code using puppeteer! How cool is that? 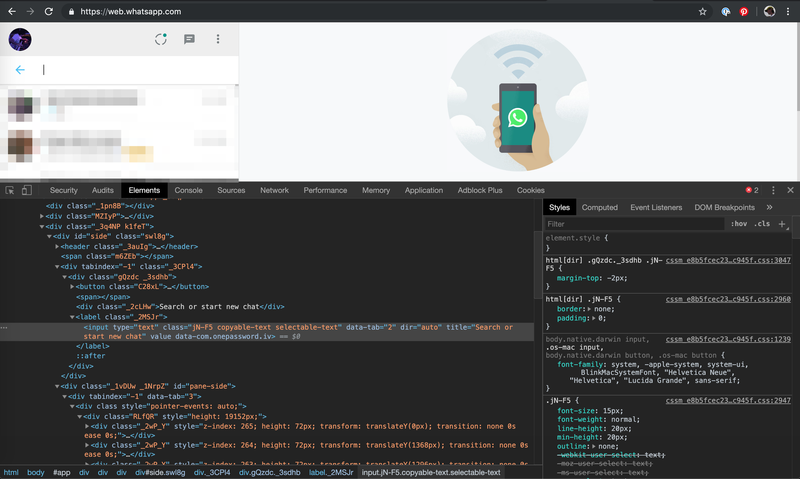 If he was able to automate VS Code because it was an electron app, I should be able to do that with the WhatsApp app. I don’t need to hack electron. 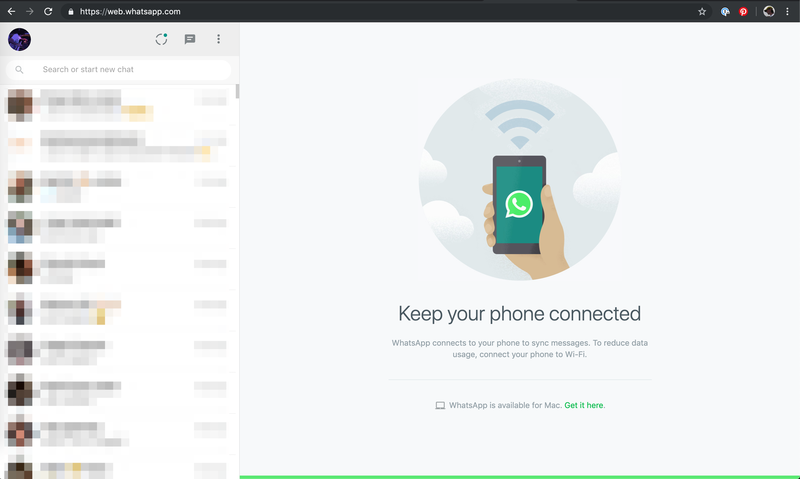 WhatsApp has a WebApp!!! We want to create a basic chatbot. It would wait for a trigger word and respond accordingly. Let’s take a look at the WebApp. Search for a Group or a Person. Select that Group or Person. Type a message when needed. I need to know how to search for a group, click on that group and type a message. DevTools is our best friend for this task. All the page is inside a #pane-side div. The search chat has a jN-F5 class. Each person or group in the list has a _2wP_Y class. The chat input is an editable DIV with a _2S1VP class. The send message button has a _35EW6 class. There is a DIV containing all the messages and it has a _9tCEa class. Each message line is a DIV with a vW7d1 class. We are going to create a regular console app, using the Puppeteer-Sharp NuGet package, of course! First, we need a browser. We are setting Headless in false mainly because we need to scan the QR code with our Phone the first time. We can set that to true afterward. Now, let’s navigate to the page. .WaitForSelectorAsync(WhatsAppMetadata.MainPanel); will wait until the WebApp is loaded, this is a good time to scan the QR code if needed. Before searching for a person or group, let’s add the CommanLineParser package. I love this package when I need to code reusable Console Apps. It will not only create an instance of a class based on the arguments but also validate all those arguments. Now that we have our BotArgument class let’s go back to our app. Pretty cool ah? We query for an element, we type on it, and then we wait just a little bit for the DOM to be refreshed. If we assume that the person we are looking for will be the first one on our list, we will know that it will be the second item on that list, because “CHATS” will be the first item. We query all the items on the list, and we select the second one. This is the fun part, and I think this something you will like to learn. How can we start listening to new messages? A callback function on our side. ExposeFunctionAsync will help us register a C# function on the Chromium side. Check if the message contains a trigger word. The last two lines are not so important now. But what they do is saving that message in a File, so we have more content to be able to create new messages. What we are doing here is observing changes on the childList of our WhatsAppMetadata.ChatContainer element. Inside the observer, we will filter items where the class value is our MessageLine const. If we have a match, we call newChat sending that innerText to C#. I found that MarkovSharp could help me build some responses based on a chat export I have. I hope this is not too much for a blog post, but the RespondAsync method would be something like this. We will get a curated list of words from the message using dotnet-stop-words. Now we will walk through the list of words in reverse order trying to find a valid message from our Markov model. The idea here is: If we get a message like “Hey this bot app is awesome”. We will get [bot, app, awesome] as valid words, and we will try to make a message based on awesome first and then app and lastly bot. Once we have a “funny” message, we will send that message back. And voilà! We have our Bot! I hope you enjoyed reading this tutorial. You will find the repo on Github. The idea of this post was not only showing off this bot but also presenting some techniques and tools you can use to automate a browser.